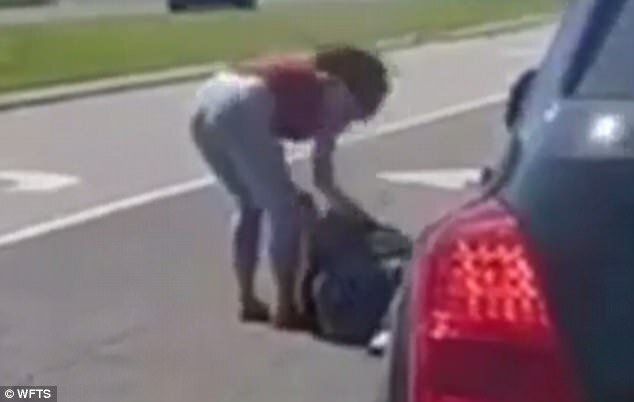 A road rage video has been making the rounds after a woman and her stepmom was recorded beating another female driver unconscious. Alicia Nikole Scarduzio, 20, and her stepmother, Shelley Lyn Gemberling, 49, have been charged with aggravated battery after they were caught on film attacking Emily Bailey. Emily told police that she was driving in Tampa, Fl around 3:45 PM when she was almost run off the road by Scarduzio and Gemberling. She honked her horn in response, but when she pulled up at a red light, she saw the defendants pull up alongside her. ‘It was the longest red light of my life. They kept screaming at me, telling me they wanted to f***ing kill me. I just wanted the light to change, she told WFLA. The victim said that she’d desperately tried to close her window when she saw Scarduzio and Gemberling get out their car and approach her. Gemberling had then reached in through the window and grabbed Bailey round the throat, while Scarduzio yanked her hair, she told police. ‘They tried to drag me through my window. When I looked into the woman’s eyes, I saw pure rage. It looked like she wanted to kill me,’ Bailey said. They beat her unconscious and video shows the women repeatedly hitting the woman as she lay on the ground. The attack finally came to an end after another motorist, who’d been yelling at them to stop, ran over to intervene. Bailey was left with a broken nose, concussion, and bruises from the assault. She said that during the attack, all she could think of is her little boy, and every time she has to get in the car, she thinks twice. Scarduzio and Gemberling were arrested and charged with aggravated battery and burglary. Gemberling, originally from New Jersey and now living in Florida, works at Catches Waterfront Grille and Rum River Bar, according to her Facebook page. Leave it to Florida to have the best stories.